General WBAI membership dues are $175.00 per year. The WBAI invites you to become a Sustaining Member, a new offering from the WBAI. Sustaining Membership dues are $250. Sustaining Members provide unique support to the WBAI’s programs and services and are recognized on the WBAI website and major event program books for their added commitment. 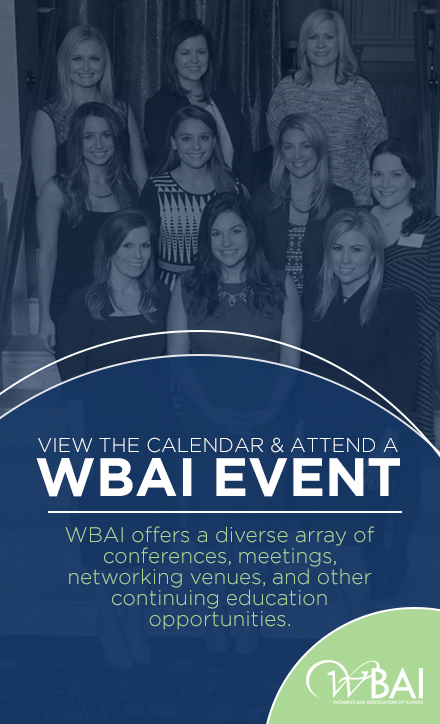 Free or discounted admission to WBAI events. Our annual events include the annual Golf Outing, Judicial Reception, and Annual Dinner. Other networking events are held throughout the year. Check out our events calendar for more information. Username and password to gain access to secure portions of our website. Subscription to our newsletter and ability to submit articles. Participation in our mentor program. your career. As you know, before you are even sworn in, you will compete with hundreds of other law students for your first legal position. We are sure you are already aware of how important it is to have someone more experienced than you share their knowledge of the practice of law. The first few years following your graduation from law school will be crucial in the advancement of your career and it is therefore vital that you have someone guiding you. The Young Lawyers Committee will be the perfect place for you to gain leadership experience. Join now and allow one of our members to introduce you to prominent professionals within the legal community and help you feel at ease at bar association events. Or take a break from studying and can meet other law students and young attorneys at one of our new member receptions! Eligibility: Must be currently enrolled as a law student. Whether you are a new attorney who is looking for your first legal position or just starting one, you are aware of how important it is to have a more experienced attorney share their knowledge of the practice of law. These next few years will be crucial in the advancement of your career and it is therefore vital that you have someone guiding you. Join now and allow one of our members to introduce you to prominent professionals within the legal community and help you feel at ease at bar association events. Or join now and meet other young attorneys at one of our new member receptions now that you are finally done studying! Eligibility: Attorneys and recent graduates who have been practicing for less than one year are eligible. The WBAI offers a strong foundation for new attorneys. Young attorneys in the WBAI establish their presence in the legal community by taking on a leadership role in one of our committees, publishing articles in our newsletter, searching our career center for job postings, and networking at our many events throughout the year. You might be thinking that it is time to make a move to another legal entity or becoming an expert in your practice area; join now and allow one of our members to introduce you to prominent professionals within the legal community who can help you reach your professional goals. WBAI members working for a government agency or non-profit enjoy all of the member benefits at a reduced rate. Attend one of our free CLE events hosted by our practice-area committees, such as the criminal litigation committee, commercial litigation committee, or domestic relations committee. Give back with the WBAI: run or walk with the WBAI team at the Race Judicata; volunteer to help with the Dress for Success Program; or help the WBAI fundraise for scholarship money at the Rise Up Reach Back Luncheon. Assistant state’s attorneys, public defenders, and assistant attorney generals are just a few examples of the types of attorneys that qualify for this discounted rate. Eligibility: Must be working as an attorney for a government agency or non-profit organization. Judiciary excluded. Eligibility: WBAI Member who has been in good standing continuously for 40 years or continuously for 15 years and has made a one time payment of $1,750.00.